One of my favorite Thai dishes is khao soi, the curried noodles that hail from Northern Thailand. With a variety of textures and loads of rich broth, it makes a satisfying meal. Recently, my Bangkok Glutton friend Chow arranged for her aunt to share their family’s recipe for khao soi with us. We returned to Chow’s kitchen to try our hand at recreating the recipe. While the results were good, it is safe to say that we are going to need a lot more practice before Chow’s aunt has anything to fear from our competition! Khao soi is made with egg noodles. 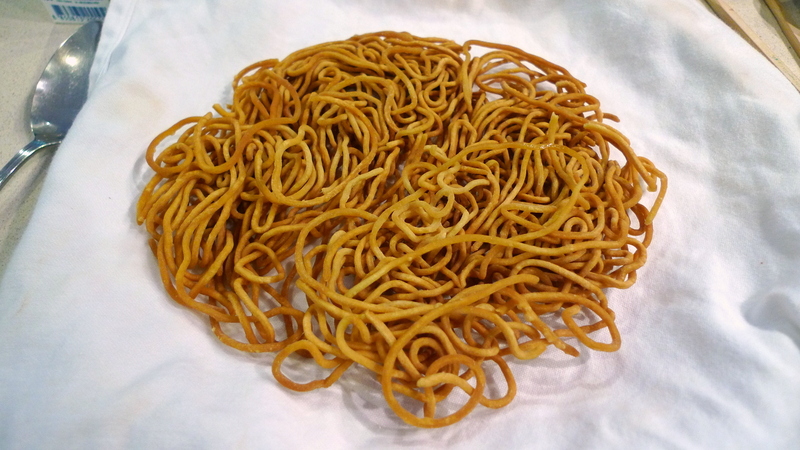 There are a variety of types, but if you have an Asian market in your city, any fresh egg noodles will do. The noodles are split into two batches: one that is blanched in boiling water and the other that is fried to make a crunchy garnish. The fried noodles are easier to make than I expected, not requiring much oil at all. 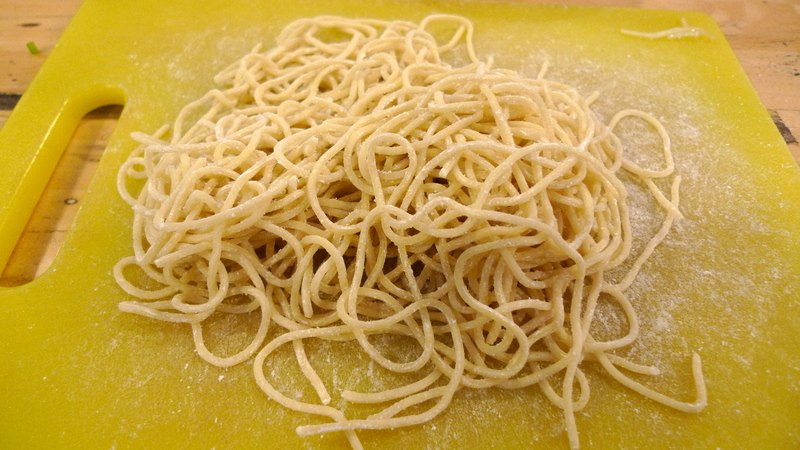 The resulting crispy noodles are addictive. Hard to not eat them before finishing the rest of the cooking! 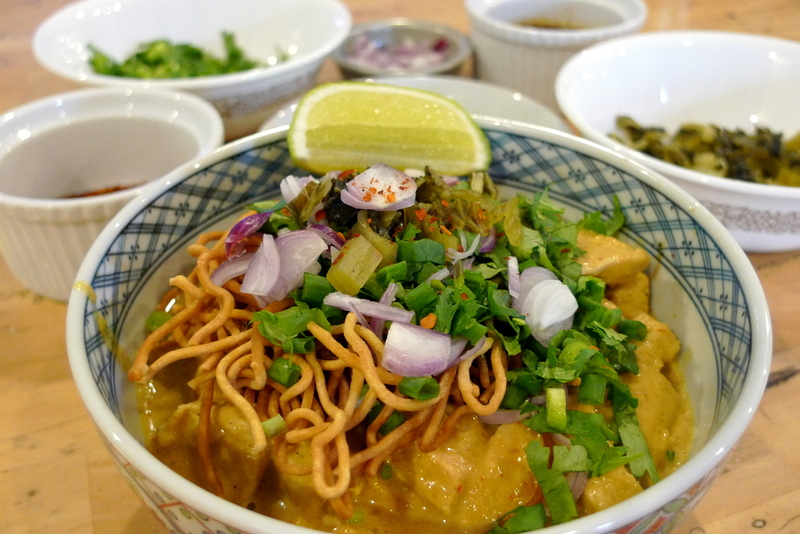 The base of the khao soi is a yellow curry combined with a fried mixture of ginger and shallots. 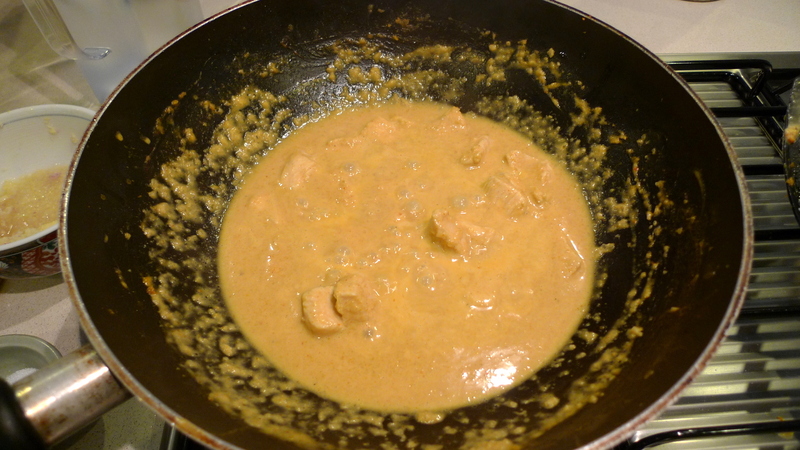 You can use any yellow curry paste available at your local Asian market. The better the quality paste, the better the flavor, of course. Like many curries, coconut milk is added to create richness. You can use a “lite” coconut milk or add some broth to thin it out. For the meat, you can use any type of meat you like. Beef and chicken are more traditional but pork or firm tofu would be fine. The flavor of the curry might overwhelm shellfish, though. 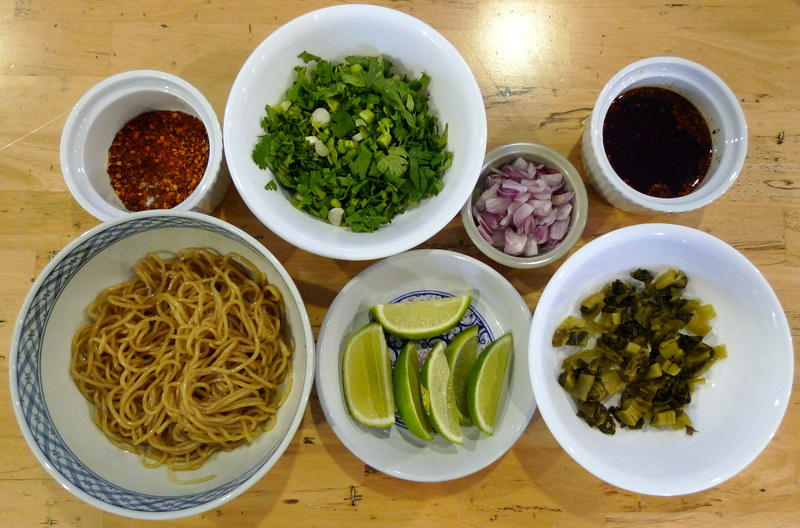 Like all noodle dishes in Thailand, proper khao soi is served with a variety of condiments. Here, you have dried chili flakes, chopped green onions and coriander, fresh shallots, chili oil, minced pickled cabbage (rinse off some sauerkraut as an easy substitute), and fresh lime. The end result looked fantastic and tasted good. Getting the proper balance of flavors – fish sauce and sugar need to be added to taste – is where the secret of a true khao soi master lies. Again, Chow’s aunt has nothing to worry about! 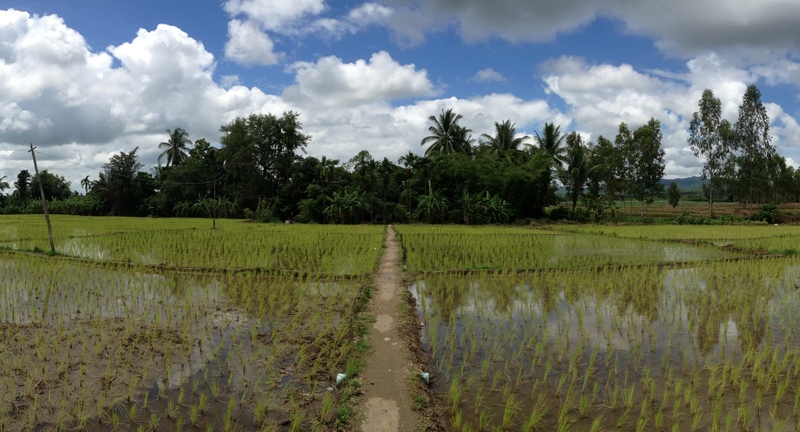 Last weekend, I traveled to Mae Sot, the largest town in Tak Province, Thailand. 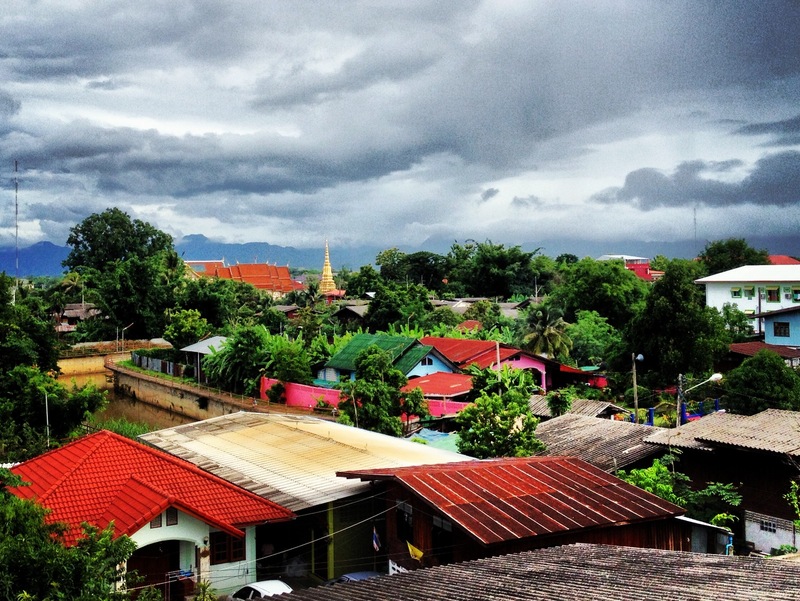 Situated on the border with Myanmar, Mae Sot is home to an estimated 100,000 Burmese refugees and immigrants – a number equal to the official local population. The purpose of the trip was to visit an orphanage and secondary school supported by some of my Singaporean friends. The trip had a powerful impact on me and in the week since, I have spent a lot of time pondering how I can best contribute to improve the lives of these children. Perhaps the best way to share this experience with you is to post some pictures and write some explanatory thoughts. Mae Sot is not a particularly large town. Nestled next to the border, it is common to see Burmese script on many signs and plenty of people are dressed in traditional Burmese outfits. The mountains of Myanmar are on the horizon and the gathering storm clouds seem to speak to the challenges that people on that side of the border face. The orphanage is located in a residential neighborhood on one side of town. It is a typical Thai-style wooden house, built on stilts and with open windows for lots of ventilation. It cannot be much larger than 100 square meters (about 1000 square feet). The upstairs includes the kitchen, a small dining area, and two large rooms that are used as a multipurpose area and the girls’ dormitory. Downstairs, part of the area below the house has been bricked in and serves as the boys’ dormitory. 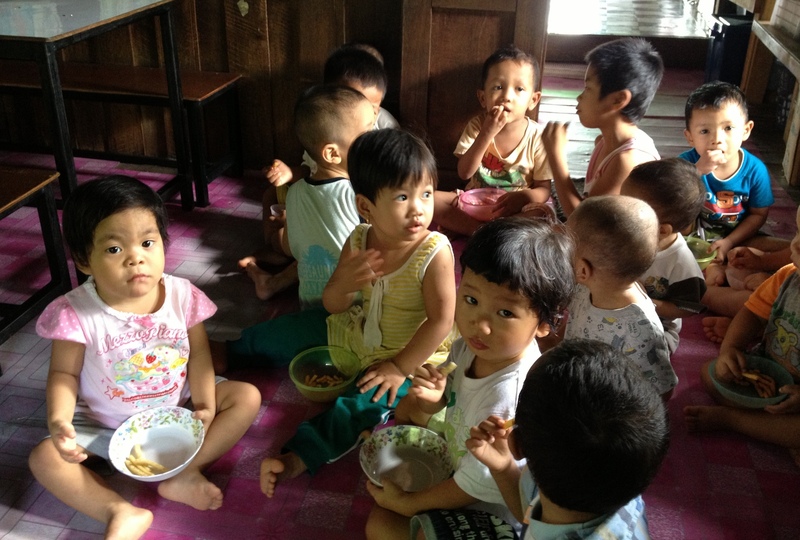 Approximately 60 children live in the orphanage, ranging from just under one year old to about thirteen. Technically, children could stay until age eighteen but they currently have no children that old. The orphanage is run in a very organized manner. 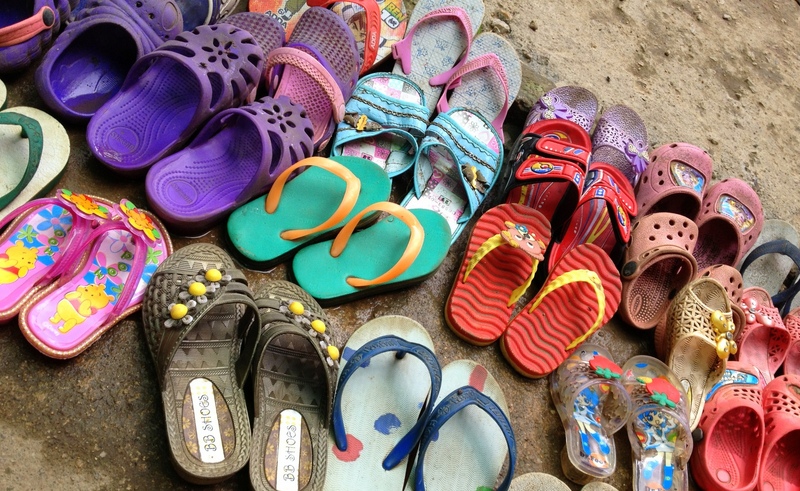 Here, the children neatly line up their flip-flops on the concrete pad at the base of the stairs. As with all houses in Thailand, you do not enter with your shoes on. The orphanage is run by a Chinese-Burmese couple who spent many years living in Singapore, which is the connection with my Singaporean friends. Perhaps their sense of organization comes from having lived in Singapore! With no children of their own, the couple and four hired helpers take care of the orphans. While there are chores to be done, there is also time for fun. 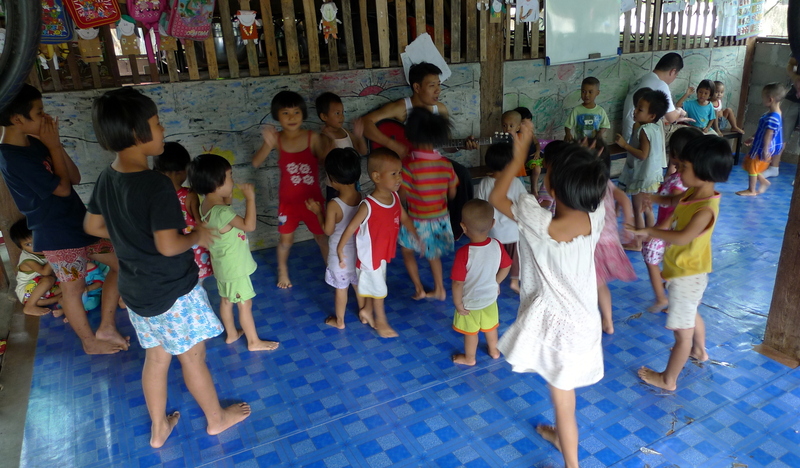 “Papa” plays the guitar and leads the children in songs and dancing. Extra effort is required for some of the children including the four youngest (all at just around one year old), two children who have polio, and a few children who have some developmental disabilities. While the amount of work may seem daunting, the systems in place allow the orphanage to operate efficiently and all of the children seem satisfied, cared for, and know they are loved. The details of the systems and processes intrigued me. 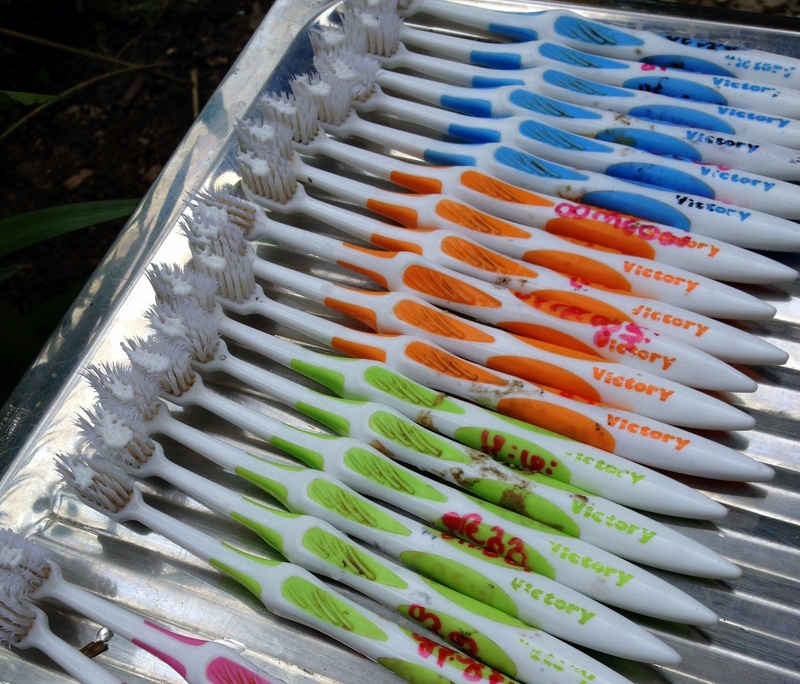 Here, a row of toothbrushes are laid out in preparation for the after-lunch tooth brushing. While they are a bit worn out, each child has his or her own brush (names are written on them) and good hygiene is stressed. An important part of the process is that the older children help with chores and take care of the younger children. Two of the boys – brothers who are nine and ten years old – are responsible for ensuring that each child brushes his or her teeth and they help the younger children who have not yet learned how to brush. Time and time again, I saw children who were only six or seven stepping up to care for a crying younger child without anyone having to ask them. It made me realize that children in higher socio-economic situations are generally spoiled and not asked to contribute very much to the family in comparison. The children do have a play area, protected from the sun and with a good breeze. Many toys have been donated so there are plenty to choose from. Interestingly, I did not see many arguments or disagreements about toys. The children seemed to share pretty well. 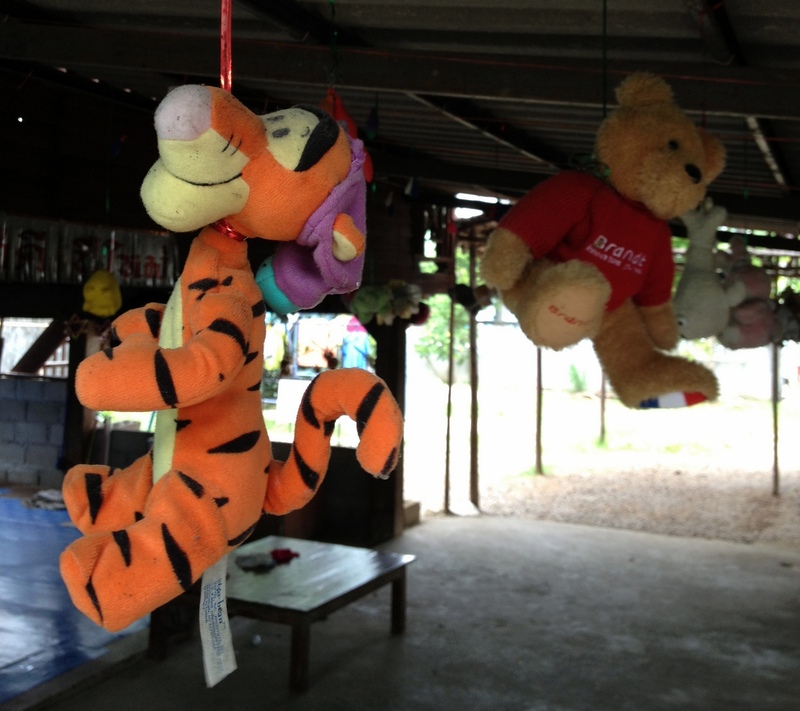 One macabre sight was the rows of stuffed animals hanging from the ceiling, like the victims of political violence by the Cartoon Network. The couple explained that while there are more stuffed animals than there are children, the stuffed animals resulted in possessiveness with children fighting over them. Instead, they are now suspended from the ceiling so everyone can see and enjoy them but nobody can claim them as their own. 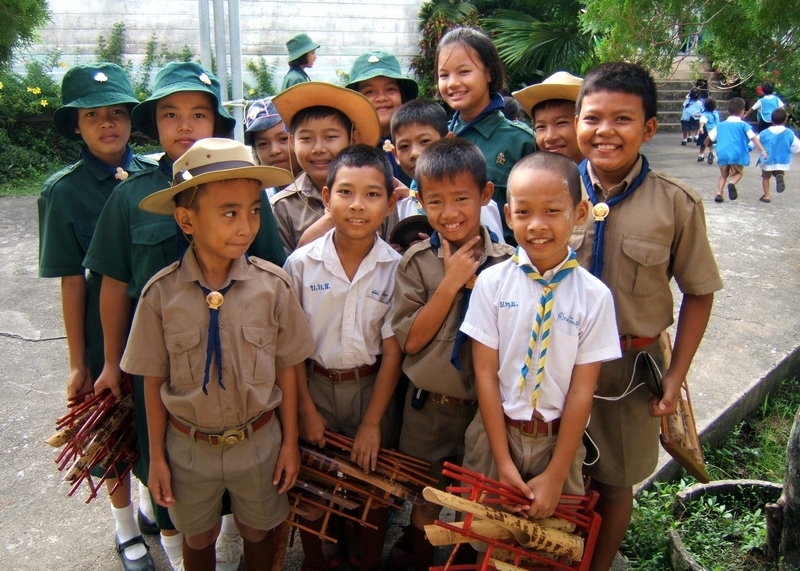 While the older children (starting around age five) attend the local Thai public school, the younger children remain home all day. After their afternoon nap, they received a snack of crisps. They were generally quiet and reserved without the loud volume you might expect from a group of toddlers. The second afternoon there, we rode in the back of the orphanage’s covered pickup truck to collect the children at school. This is done in two batches since there isn’t enough room for everyone in a single batch. This two-batch method works okay because the younger children finish school about thirty minutes before the older children. 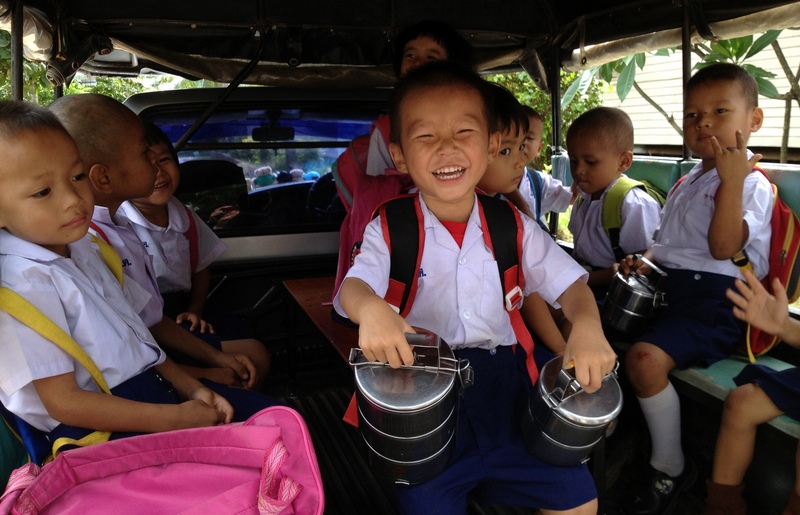 This young boy with the two lunch boxes was especially cheerful, a constant giggler. While almost all the children were friendly, they were also a bit shy and some would sit in the corner and hesitate to play. My impression is that their life experiences may have led to some emotional damage and they may hesitate to connect with others for fear of abandonment. Perhaps I am over-psychoanalyzing, though. We also attended what could best be described as a day care. 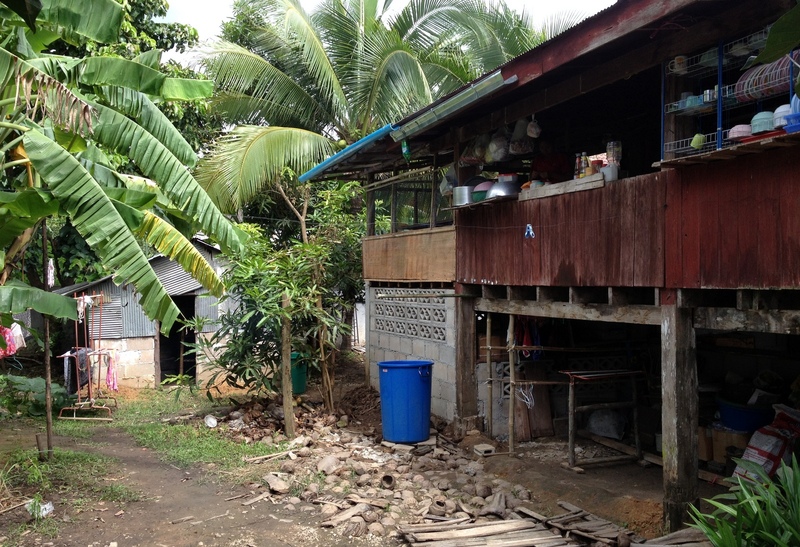 The couple responsible for the orphanage also set up a small outpost (a house and covered porch) on the other side of town, designed as a place to teach Burmese migrants to be community teachers. Most of the lessons they teach are Biblically-based but also include general life skills such as budgeting, parenting, etc. What they noticed was that children from the nearby families (all of whom are migrant laborers) would hang out at the covered porch and use it as a play space. So they engaged some volunteers to work as teachers and try to educate and feed the children every day. Since one of my Singaporean friends is a comic artist, he conducted a class for about forty children, teaching them to draw cartoon rabbits. 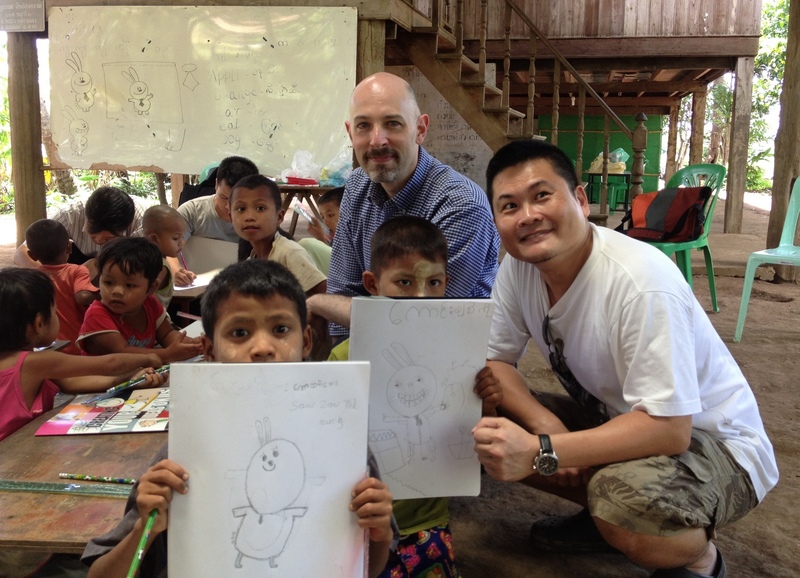 The children enjoyed drawing and despite a lack of a common language, the instruction went well. 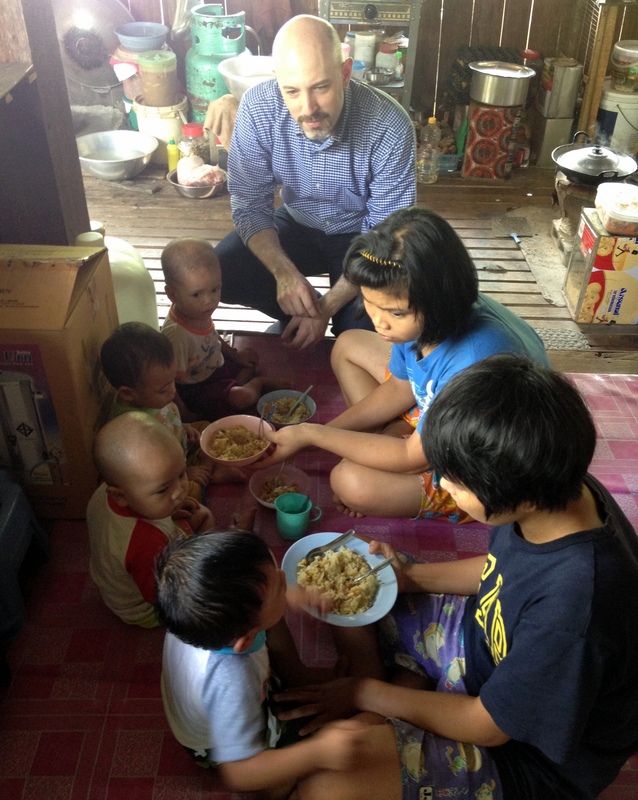 All of these children speak only Burmese. Since their parents are mostly undocumented and are itinerant laborers, the children have no opportunity to attend school and, as such, will likely face a life of labor themselves. Not realizing at first that they didn’t have any formal schooling, I tried speaking to them in Thai but that wasn’t any more helpful than speaking to them in English. Here, I struggle to help one student sharpen his pencil with a cheap plastic pencil sharpener. The third place we visited is a secondary school or, more accurately, an official “learning center”. The school serves about 100 students, all of them the children of refugees or migrants. While licensed by the Thailand Ministry of Education, it isn’t an official school because they teach outside the proscribed curricula. Classes are conducted by five teachers in English and Burmese. 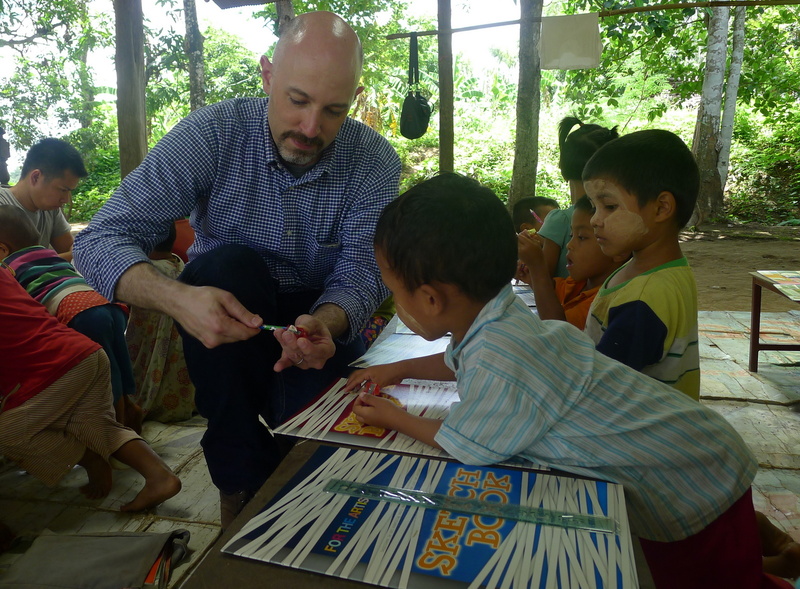 A series of volunteer teachers also visit for month-long stints from universities in Hong Kong and elsewhere. The school boards all of its students. It is located on the outskirts of the city, past an immigration and police inspection checkpoint. Most of the students are undocumented so it is not practical for them to come to school each day so, instead, they just live there. 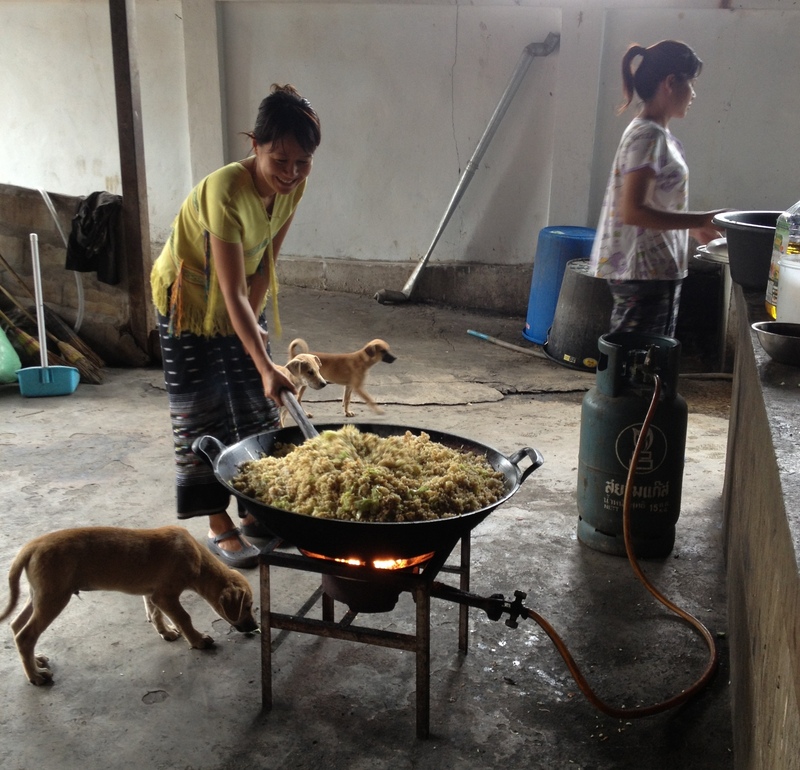 The teachers prepare food for three meals a day. Here is a large batch of fried rice, a very simple lunch. Most weeks, there is the budget to only have meat – chicken bones, for example – about once a week. 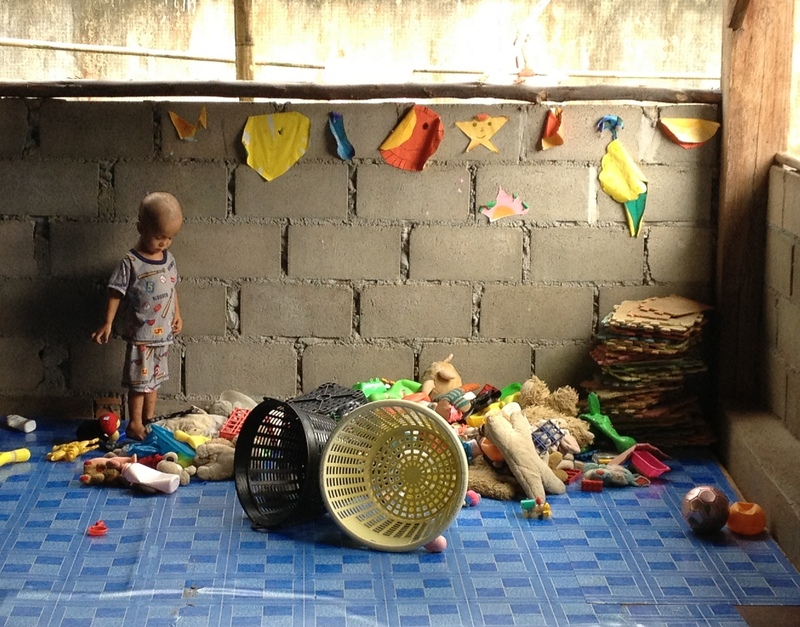 The school, along with the orphanage and day care, runs on a very tight budget. 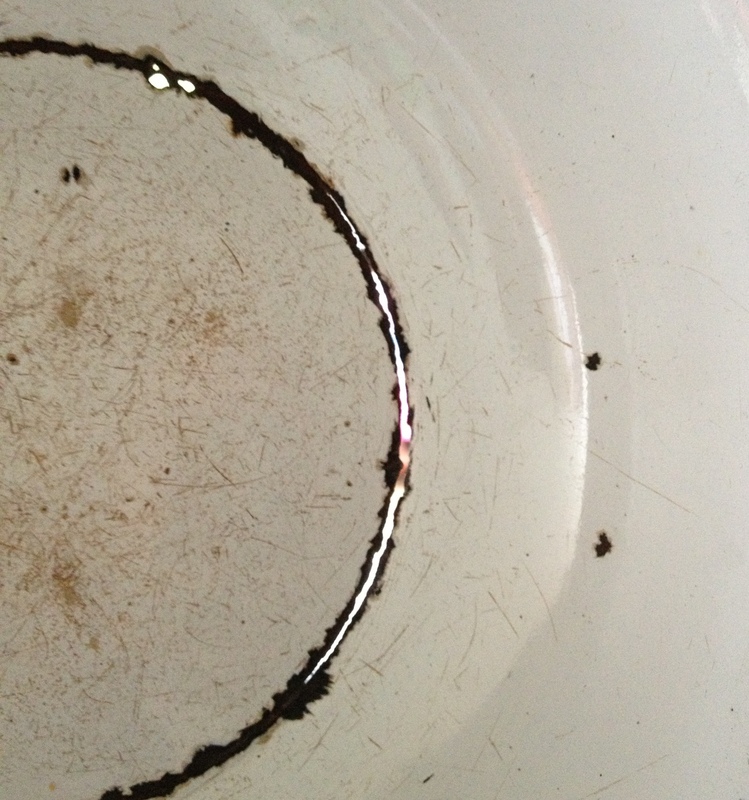 This picture is of an enameled metal bowl that is used in the school kitchen. It has been used so long that it has literally worn through in spots. Speaking with the schools’ volunteer director, a young European woman who has been there three years, the list of “nice to haves” include things like new bowls, plastic hangars, and sponges, but that they generally only have the money for necessities. On the afternoon of our departure, several of the older children from the orphanage rode with us to the airport, a chance for them to see an airplane and wave goodbye. As for me, I think it is not “goodbye” but “until next time” because I plan on returning soon. More importantly, I am going to look for ways to help, whether that is by gathering funds and supplies or by raising awareness. Yes, the world is full of people who need help. These three places seem to be very well-run, doing good work with minimal (maybe even non-existent) overhead, and strike me as a good place to try to make a difference. A friend from Xanga suggested a few months ago that going back and browsing through earlier entries is a good way to round out your knowledge about a blogger. That’s a good idea as I’ve just set up on WordPress, you don’t have many back entries through which to browse! To simplify things, here is a brief introduction of myself. That way you can do as much or little catching up as you wish to do. My name is Chris. I’m an American citizen who was born in 1970 and raised in the San Francisco Bay Area. 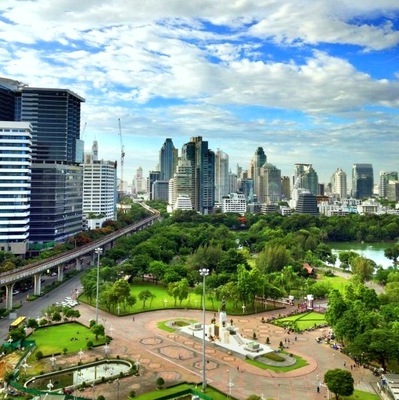 Since October 2005 I have been a resident of Bangkok, Thailand (which I often refer to using its Thai name, Krungthep) where I live with my husband Tawn. I started blogging a few months before moving here. Its initial (and continued) purpose was to provide my family and friends an easy way to keep tabs on what I’m up to and the experiences I have as an expatriate. A lot of what I write is about that experience. 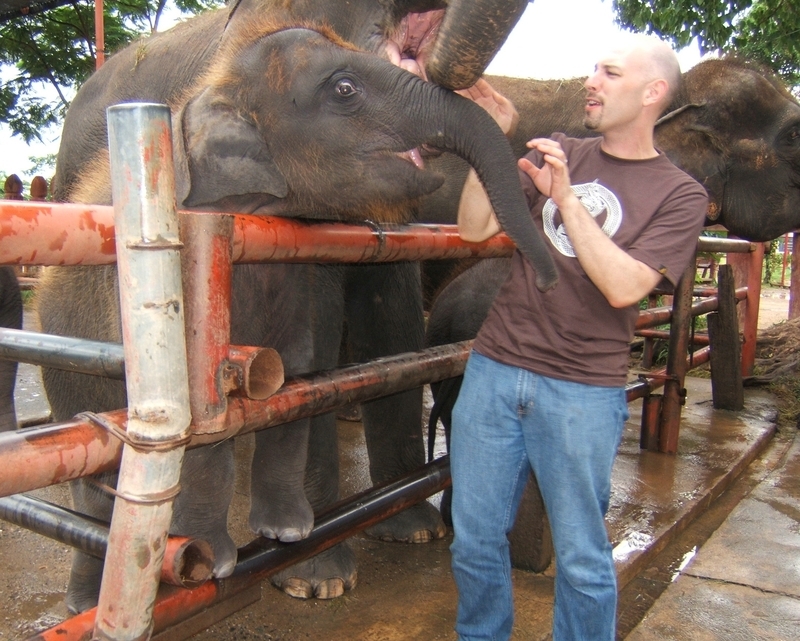 Chris at the Elephant Kraal in Ayutthaya province. I’ve written about my thoughts about possibly moving back. I’ve written about what it’s like to live in Thailand. I’ve been studying Thai since moving here and now read, write, speak and even sometimes understand the language. Living abroad has a lot of challenges. For example, learning to cross the street without getting killed! Other challenges have included making friends in a strange land and dealing with fellow countrymen whose views on being an American rubbed me the wrong way. Living here has provided so many wonderful adventures. I’ve done a lot of bicycling to explore the city and surrounding areas, resulting in some interesting and unexpected misadventures. For more than a year, I volunteered as an English teacher once a week at a tiny country schoolhouse ninety minutes outside Krungthep. I discovered the schoolhouse on one of my bike rides, had a great time teaching there, and concluded the assignment when the director of the school retired. They even included me in their Teachers’ Day ceremonies, which was a great honor. My students at Bangkhonthiinai School in Samut Songkhram province. Along the way, we celebrated the 60th anniversary of His Majesty the King’s reign (the longest reigning current monarch in the world, by the way!). We had a coup. My parents and some other family members came to visit. Tawn and I bought and remodeled a condo. And we hosted a lovely poolside Thanksgiving dinner. 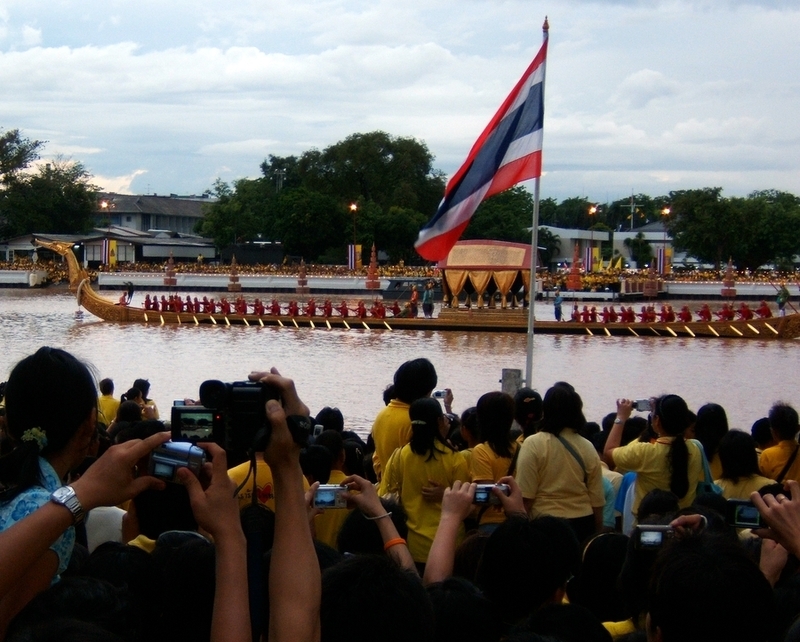 Watching the royal barge procession to celebrate the King’s anniversary. Of all the writing I’ve done about Thailand, though, the one that has received the most views was one I wrote about the debate over teenage castration, a practice common in young Thai men who feel that they are transsexuals. For some reason, there are a lot of people who Google “teenage castration” and it seems my entry is pretty high up in the results. As I mentioned, I live with my husband Tawn. We were married in August 2009 in the United States although we’ve been together since early 2000. The story about how we met is a sweet one, deserving of a movie screenplay. After we first met, Tawn lived and studied for his master’s degree in San Francisco. Now that I’ve been here in Thailand for more than four years, I’ve spent more time living here than Tawn spent living in the US! Tawn and I a few days after meeting in January 2000. When viewing those entries, you might notice that Tawn is a man and so am I. While I don’t feel the need to make a big fuss about it, it seems that my being gay is a matter of fact that comes up quite often. For example, when we wanted to get married in California but couldn’t because 52% of the voters thought we shouldn’t have that legal right. Thanks to rulings in mid-2013 by the United States Supreme Court, that issue is somewhat moot. But this blog isn’t all about love and marriage and Thailand and politics. The real undercurrent of this blog is food. I’m a foodie. Not only do I enjoy eating, I love to cook. I particularly enjoy trying foods I’ve never made before, just to see if I can. Bagels, French macarons, pasta, baking bread – I’ll try cooking or baking anything just to see if I can. 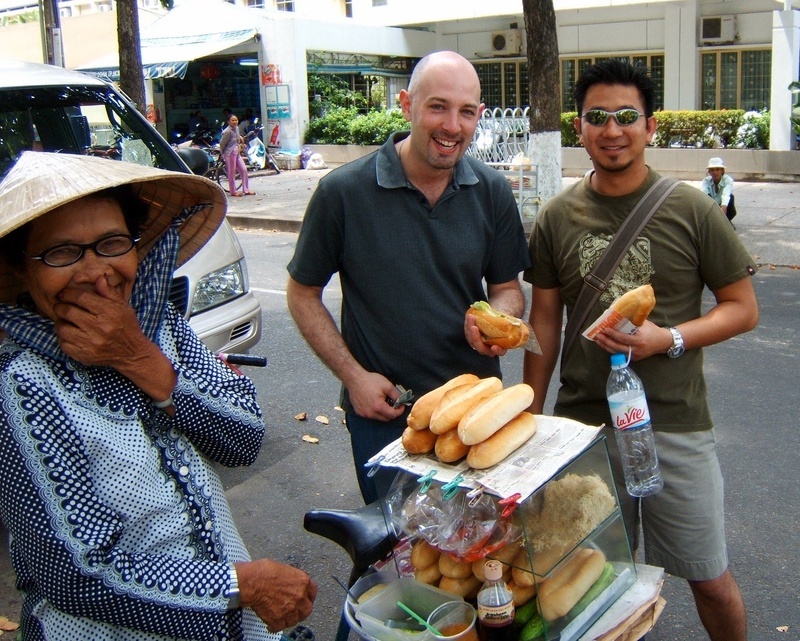 My friend Ryan and I buying bánh mì from a vendor in Saigon. In addition to food, I love travel and enjoy meeting new people. I’ve had the chance to meet several other Xangans both in their hometowns and here in Thailand. Tawn and I have been fortunate (not having children makes it easier…) to be able to travel a lot. We had a fun trip to Tokyo last spring, a trip to Saigon a few years back with a dear school friend, a trip to Seoul the winter I arrived in Krungthep, and a honeymoon in New York City, just to name a few destinations. So that’s me in a nutshell. There’s so much more I could write and so much more I’ve already written. But I’m glad we’ve had a chance to meet and I hope you’ll enjoy reading my blog. Which brings me to one more thing… one of the things I most appreciate in a subscriber is interaction. We’re all busy, I get that. But when people subscribe and never, ever leave a comment, it makes me wonder what interests them about my blog. It’s a little freaky, in fact. And when people send a friend request but have never commented even once? Well, that’s not much of a start to friendship. So don’t be shy, people. I’m not asking for a lot, but a bit of interaction and an occasional comment means a lot for me and I think it strengthens the sense of community here. 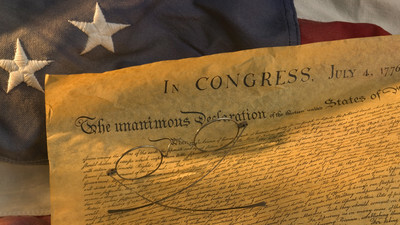 These words begin the preamble of the Declaration of Independence, in which 237 years ago this day, the thirteen American colonies announced that they considered themselves states independent of Britain. 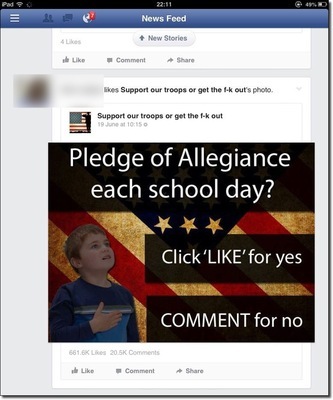 This long experiment with democracy has had its ups and downs. The downs have always coincided with efforts to limit the rights of members of society. The ups have always coincided with the triumph of these rights over attempts to limit, stifle, or deny them. As has been said, the United States is a great nation. Definitely not as great as we sometimes think we are, but still a great nation. Let us use this Independence Day as an opportunity to appreciate the many positive attributes of our democracy and to rededicate ourselves to the self-evident truth that all men are created equal and that we are only equal when our unalienable rights are available to all. 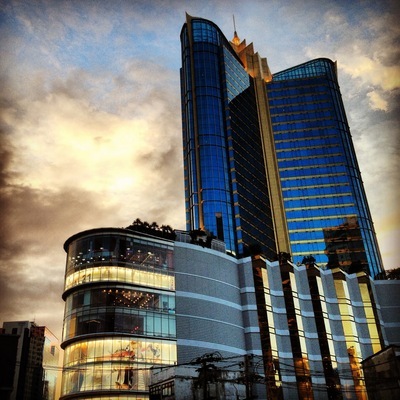 Turning away from the politics, the Xanga fundraiser, and all that serious stuff, I just wanted to share with you two pictures of Bangkok taken the past few days. This isn’t a particularly pretty city, but these two pictures do manage to capture the city’s nicer side. Taken by visiting Singaporean friend David Chein (follow him on Instagram at davidchein), this is a view of Lumphini Park taken from the Dusit Thani Hotel. On the left side you see the Silom Skytrain line running past the headquarters of the Thai Red Cross. In the distance are the upscale hotels and offices in the Ratchadamri neighborhood. In the foreground is the statue of King Rama VI, which sits at the corner of Rama IV and Ratchadamri Roads. We have had strong winds the past few days so very little haze. Late yesterday afternoon, I took this picture of Terminal 21, a mall, office tower, and service apartment complex located at the corner of Asoke and Sukhumvit Roads. With the setting sun behind it, the building took on a glow that looks just like a computer illustration. It was a real photo, though! Pictures like this remind me that while Bangkok can be a bit scruffy sometimes, there is still beauty to be found.